Fragrant, white flower spikes, 3-6" long, cover the shrub with bloom in early summer. 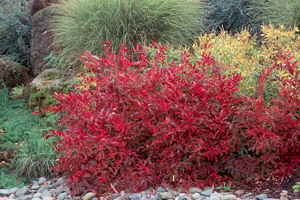 Dark green leaves turn scarlet and crimson in fall, sometimes persisting on the shrub until December. 'Henry's Garnet' is noted for larger flowers and superior fall color to that of the species.